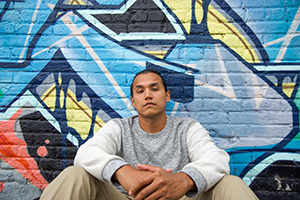 Tall Paul, a Native American Hip-Hop artist, will visit Indiana University East at 6 p.m. on Monday, April 2, in Vivian Auditorium, located in Whitewater Hall. He will share his music and insight on Native American issues. A reception will be held prior to the event at 5:30 p.m. in Meijer Artway. Denise Bullock, associate professor of sociology, is the chair of the Diversity Events Committee at IU East. She said this spring, as part of the diversity initiatives on the IU East campus, the Diversity Events Committee wanted to bring attention to ongoing Native American issues while also celebrating native culture. Tall Paul is an Anishinaabe and Oneida Hip-Hop artist enrolled on the Leech Lake reservation in Minnesota. Born and raised in Minneapolis, his music strongly reflects his inner-city upbringing. From personal expressions of self, to thought-provoking commentary on issues affecting Indigenous and diverse communities as a whole, Tall Paul’s music evokes a wide variety of substance and soul.